Lord Bhairava (Sanskrit for “frightful”) is a Hindu deity, a fierce manifestation of Lord Shiva associated with annihilation. Lord Bhairava originated in Hindu legends and is sacred to Hindus, Buddhists and Jains alike. He is worshipped throughout India, Sri Lanka and Nepal. Lord Bhairava is the wandering form of Lord Shiva and they guard the cardinal points. There are 64 Bhairavas in total. These 64 Bhairavas are grouped under 8 categories and each category is headed by one major Bhairava called Kala Bhairava, who is the supreme ruler of time of this universe as per Hindu scriptures. Goddess Bhairavi is the consort of Kala Bhairava. In all Hindu temples, there will be a Lord Bhairava idol. Bhairava is the protector of temples. 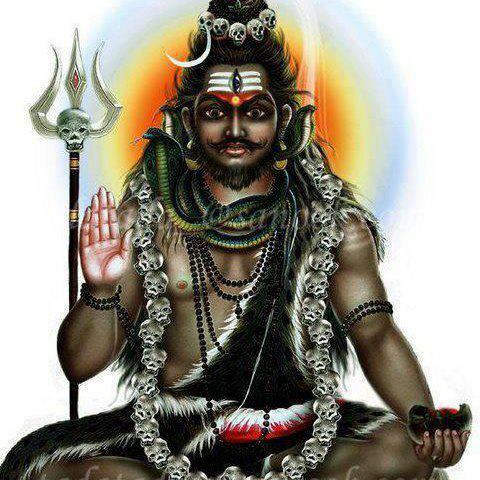 In Lord Shiva temples, when the temple is closed, the keys are placed before Lord Bhairava. Bhairava is also described as the protector of women. He is described as the protector of the timid and in general women who are timid in nature. Lord Bhairava protects his devotees from dreadful enemies, greed, lust and anger. Bhairava protects his devotees from these enemies. These enemies are dangerous as they never allow us to seek God within. Normally in Lord Shiva temples, idols of Lord Bhairava are situated in the north facing, southern facing direction. He appears in a standing position with four hands. His weapons are the drum, a noose, trident and skull. In some forms of Bhairava, there are more than four hands. He appears without a dress and with a dog. His weapons, dog, protruding teeth, terrifying looks, garland with red flowers all these give him a frightening appearance. Lord Bhairava likes red flowers, ghee lamp, unbroken coconut, honey, boiled food, fibrous fruits etc. If a Bhairava idol is facing west, it is good; facing south is moderate; facing east is not good. The right time to pray to Lord Bhairava is midnight. The most appropriate time is Friday midnight. Worshipping him destroys enemies. It is also generally believed that worshipping Lord Bhairava gives prosperity, success and good progeny prevents premature death and solution to debts and liabilities. Kala Bhairava is conceptualized as the Guru of the planetary deity, Lord Shani (Saturn). Lord Bhairava is the main deity worshipped by the Aghora sect / Aghoris.